CBD is the abbreviation for cannabidiol and is a chemical second cousin of anti-inflammatory Omega fatty acids which means it is excellent at healing and pain relief. CBD CLINIC is available as a pain relief medication and is the first and only non-prescription ointment and cream that combine FDA-approved active ingredients and cannabidiol together. CBD or cannabidiol is a legal, non-psychoactive extract from cannabis that research, and thousands of years of human experience have shown extraordinary abilities. There’s no THC, so there’s no concern with drug tests, special exams, licenses/fee, altered states or Johnny Law. Essentially you get the healing effects with no drugs or side effects of drugs. We now offer CBD Clinic for retail sale at our office location. What conditions are CBD pain relief creams used for? 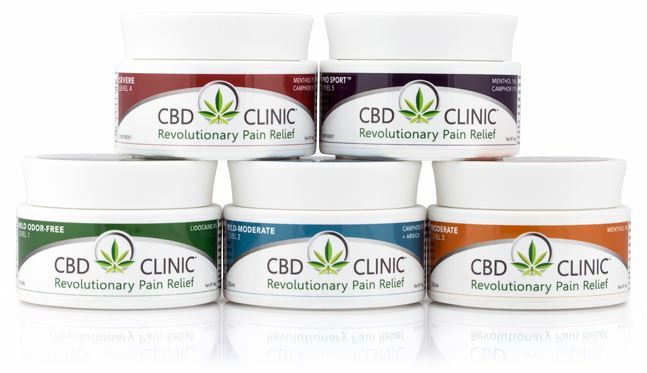 What is in CBD CLINIC pain relieving cream? CBD CLINIC contains three foundational ingredients Natural Emollients, a chemical compound known as Terpenes (not UMD Terrapins) and Endocannabinoid Modulators. These are known for relieving joint and muscle pain associated with daily living, sports injuries, arthritis, sprains, bruises and all other types of inflammation. Our skin is made to keep the outside out, and the inside in. Most chemicals, liquids, lotions, creams etc, despite what their marketing departments might tell you, can NOT be absorbed through skin without an emollient. The base formulations of the ointments and creams are made with all-natural emollients that are readily absorbed by human skin. CBD CLINIC emollients include organic beeswax, jojoba seed oil, cottonseed oil, and shea butter. Comparatively, many other topical pain relief products use cheap, synthetic ingredients for their base that are not absorbable. Terpenes are aromatic (hence the odor) hydrocarbons found naturally in the essential oils of plants. These compounds fight acute, chronic and neuropathic pain by calming the nerves. Menthol and Camphor are the two most widely used and recognized terpenes. Other equally effective terpenes found in CBD Clinic products are: Eucalyptus, Tea Tree, Clove, Peppermint and Rich-Hemp extract—are combined with Menthol and/or Camphor to reach the deepest pain. The endocannabinoid system is a group of cannabinoid receptors located in the brain and throughout the nervous system. The endocannabinoid receptor system plays a significant role in regulating neurotransmitter function (how the brain talks to the body). Studies have reported that CBD oil is capable of slowing down neurotransmitter signaling hence decreasing pain perception. Which level CBD cream is right for me? CBD CLINIC comes in 5 levels. The biggest difference in the levels is the concentration of CBD. Yes, more is better, but sometimes just a little will do. It really comes down to how often you feel like putting it on. The additional compounds and their concentration affect how long, how deep and how intense you “feel the burn” – from not at all with level 1, to pretty darn good at level 5. Level 2 pain relief cream with Camphor and Arnica extract for temporary, mild to moderate aches and pains that have been isolated in the muscles and joints. For uncomfortable, non-debilitating pain, use Level 2 pain relief which can soothe those nagging pain symptoms for massaging relief where you hurt. Level 5 ointment delivers two, highest potency pain killers to the most severe of pain areas. It helps restore your range of motion and regain the mobility necessary for top athletic performance. For Joint Pain, Nerve Pain, Muscle Pain, Lower back pain, knee pain, Shoulder pain, Neck pain, etc. Help regain range of motion in the areas necessary for top level sport performance and Flexibility. A perfect pre and post workout solution for hours of relief. Helps to speed recovery for fatigued and painful joints and muscles. Note: While this product is great for alleviating pain, we highly recommend it as a supplement to proper chiropractic treatment for healing and prevention of future pain. For more information, or to pick up a jar, visit our office at the address below.